Contrary, to what the design of this website may suggest, I think I’m at the stage where I’m a pretty decent web designer but feeling as confident in my design abilities, as I do now is a relatively new thing. So why do I feel more like a designer now, than I did 2 years ago? One word: ‘experience’. The more experienced I’ve got by creating designs plus learning how to notice good design and imitate (and subsequently adapt) it successfully. During 2003-2004, I did a work placement as a web designer for Manchester City Council – and the above screenshot shows the design I came up with for a project called MEWAN. At the time, I was very proud of this design – it took a long time and I needed a lot of mentoring to make sure it didn’t look awful but I though it was good. Looking back now, I can see that it isn’t too great. Regardless, of its appearance – it just didn’t do a good enough job of conveying the information it needed to. 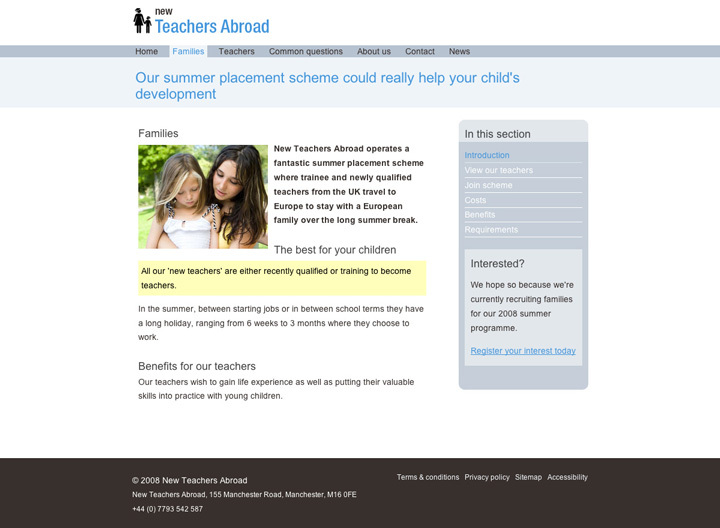 The design above is from a (as yet unreleased) website called New Teachers Abroad. Although, using a quite similar colour scheme (which I’ve only just noticed) to the MEWAN design, I feel this design not only looks better, but it does a better job of selling the content to a visitor. Creating the design took a fraction of the time that my first design took, but the results are far more substantial. Recently, I met up with a client, for whom, I’ve just completed a (well-received) design. Showing them my portfolio, made me quite pleased to realise how far I’ve progressed since those early days. I’ve always been a little scared to promote myself as capable of producing a design as well as creating the HTML/CSS templates but now I feel much more confident in doing so. To be a good designer, you don’t have to just create something that looks good – you have to get over the message you’re trying to convey. Personally, I think that a lot of web designers (and clients for that matter) neglect the last part and tend to concentrate on creating something that looks nice. I made my first website when I was eleven years old, it was about Pokemon and consisted of a single page stuffed with about 50 animated gifs and blinking text. I was so proud of it. Now.. I don’t think I would be so much, haha. It took me about four years from age 15, a one year stint at university and a job as a junior web developer where I was seriously exploited (my salary was $20k AUD a year – about £10k..)for me to realise that I’m a considerably good designer. I think you get to a point when you just know that you’re good. Looking at your earlier piece and then at the more recent design, it’s very noticeable that you’ve come a long way.